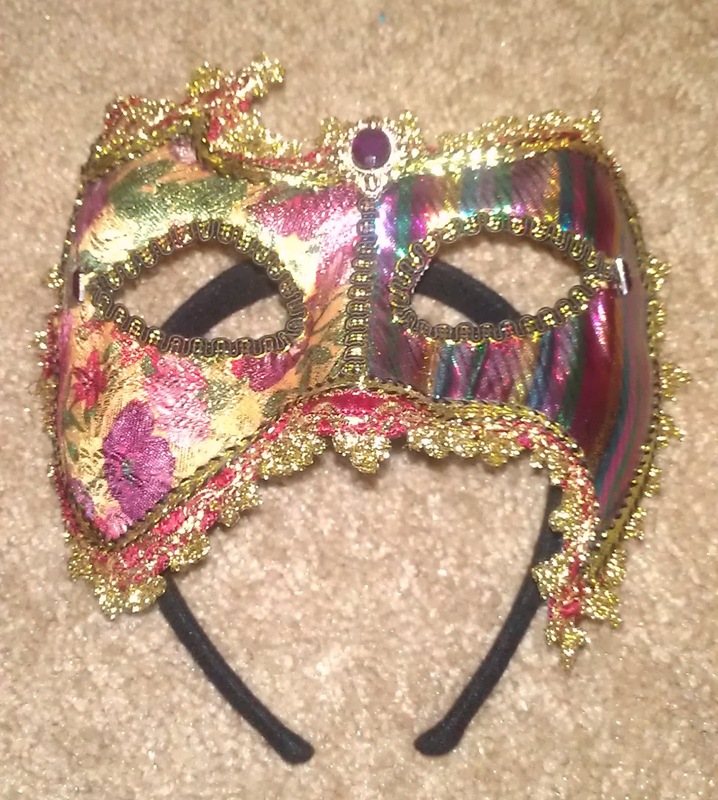 We loved the unique shape and the half-and-half qualities of this mask, even though the colors were far from what I wanted. 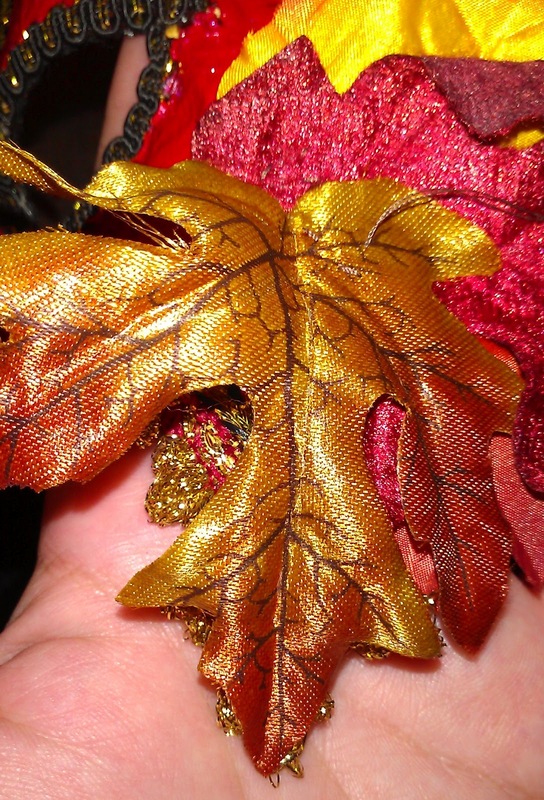 I also thought the outlines of some of the points lent themselves well to being used with autumn leaves. Little by little, I transformed the mask to match the image in my mind. First, I popped off the purple rhinestones and painted the mask. I started with this supposedly "gold" paint on one half, but decided it was too beige-y. 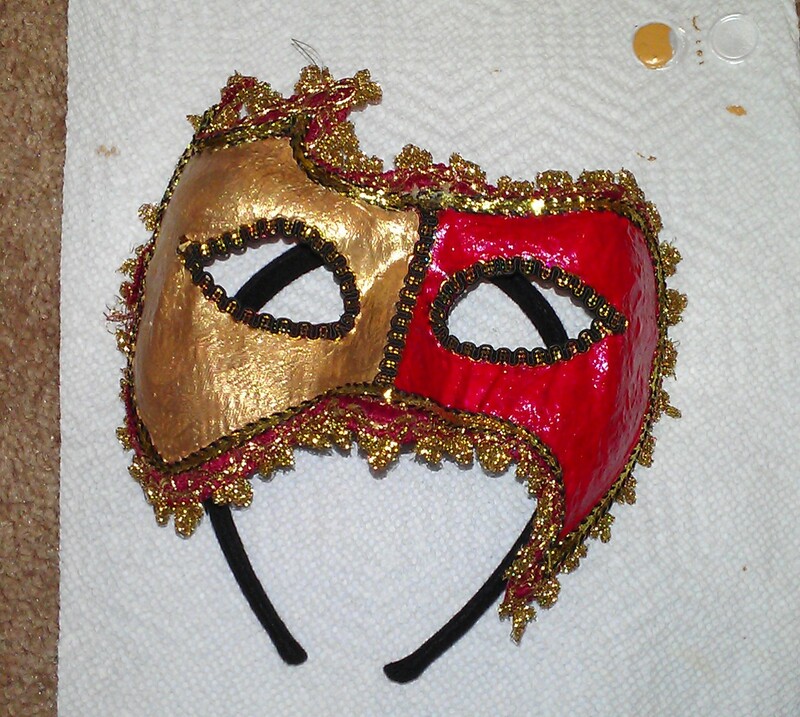 So I repainted it with a metallic gold, which I liked much better, and painted the other half scarlet. Don't you agree that the second gold color looks much better? At this point I was already liking the mask much better, and was excited to add my leaves. I played around with several colors and placements. 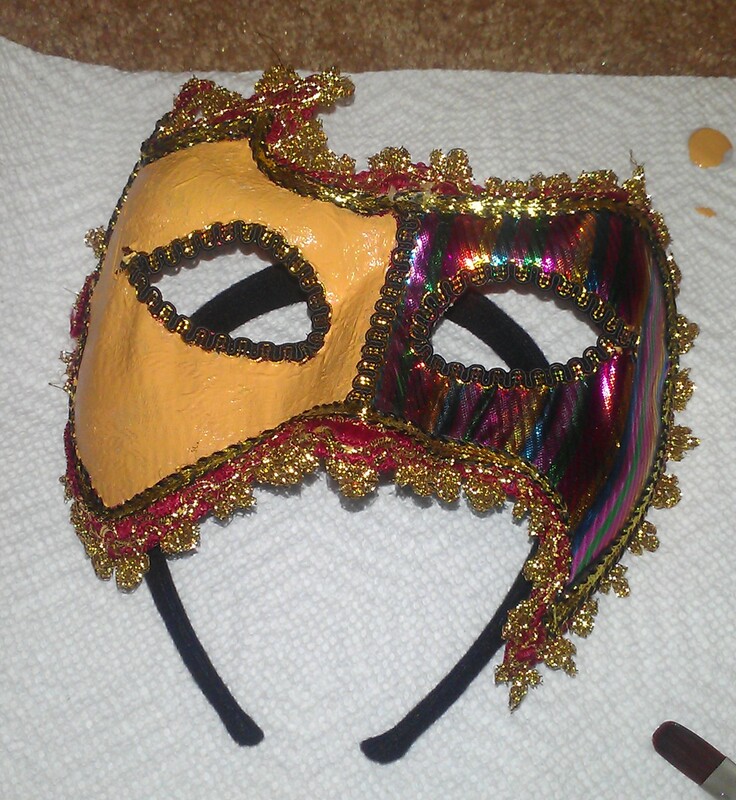 I really liked the dark red leaves and the gold/brown leaves because they complemented the mask colors, but the rest of the costume is going to be an iridescent orange/yellow, so I also wanted some lighter leaves to tie it all together. 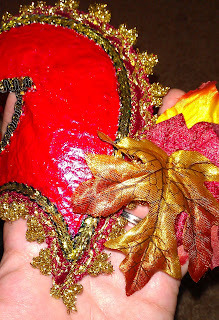 Once I figured out which leaves I wanted, I sewed them on. That was fun, sewing through a couple layers of plastic--not! But the leaves are much more secure than they would have been if I had glued them. ...and then how well the leaf lines up with it. I did this on the top points on the gold side, as well. Once the leaves were finally sewn on (seriously, that took much longer than anticipated), I was finished! 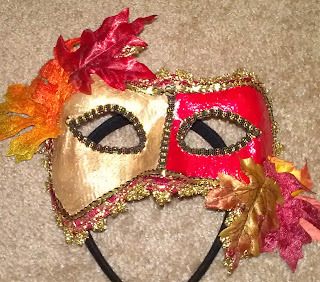 I love how the top leaf on each side plays off of the mask color on the opposite side, bringing it all together. 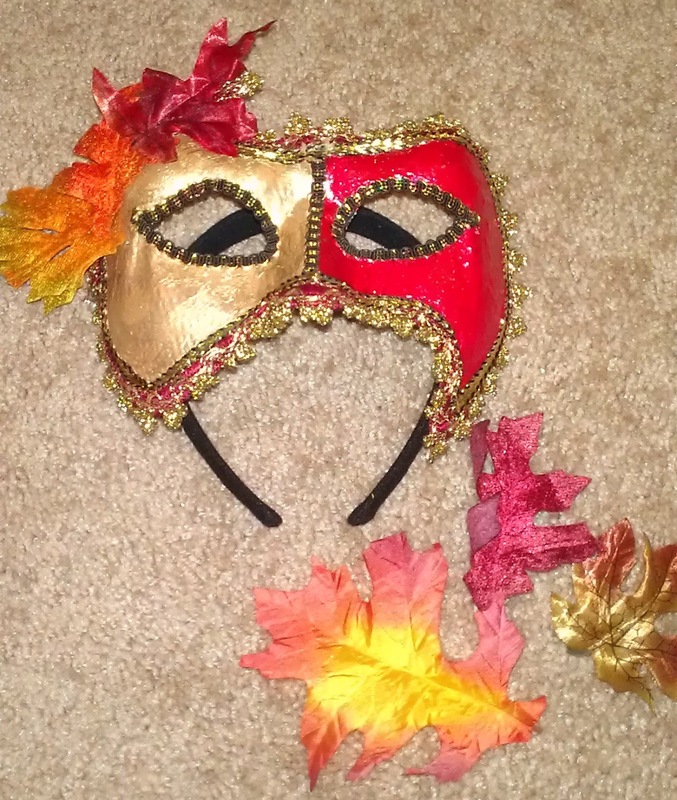 The lighter leaves add some pleasant contrast, and are really going to bring in the costume color. Hopefully I will get the costume made this next weekend (fingers crossed!) and will be able to upload pictures of it all together.